Paul and Denise have been ballroom dancing for over 15 years. Out of the blue they took a 3 week introduction course on Argentine Tango, and were totally hooked! At the time there were not very many milongas or classes being held in Calgary. So they flew several times to Vancouver, and various other Canadian cities to take lessons in this lovely dance. They even traveled to Buenos Aires, Argentina to take lessons and partake in as much Tango as possible. 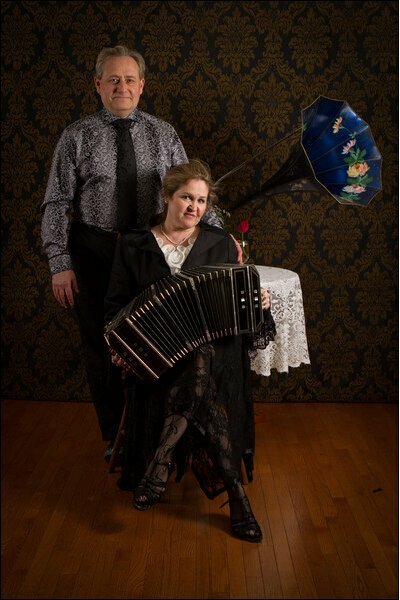 They have come to appreciate Tango history, different styles of orchestras/music, different styles of the dance, and Paul has developed a fascination and growing collection of Argentine Bandoneons (a popular instrument used in Tango). Now they are lucky enough to host their own milongas in Calgary once a month and occasionally in Kimberley BC, under the name Beso de Tango (Kiss of Tango). They are very grateful for being chosen as Tango teachers for the University of Calgary Ballroom Dance Club, which is Calgary’s longest running dance school – 42 years! They also volunteer several nights weekly for the club to promote dance by taking instructor lessons, teaching many different dance styles, and organizing dance events. It really has been a wonderful experience for everyone involved, and they welcome others to come and learn all about magical Tango. Instructors certified by the Canadian DanceSport Federation.